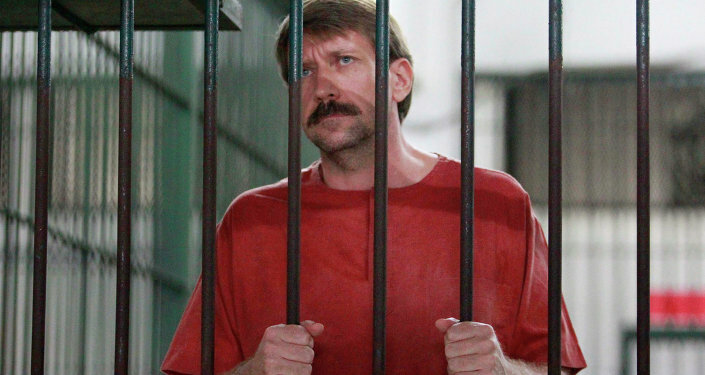 Alla Bout, the wife of Russian businessman Viktor Bout, who was sentenced to 25 years in prison in the US, has told Sputnik about the condition of her husband. BANGKOK (Sputnik) — Russian businessman Viktor Bout, currently incarcerated in the United States, has been transferred to a prison cell that holds three inmates in what is only the latest punishment for his interview with the RT broadcaster, his wife Alla Bout told Sputnik on Monday. "Viktor’s ban on phone calls expired, and he called me for the first time in two months. He told me that shortly after the disciplinary hearing after which he was prohibited from making phone calls and purchases in the prison shop, he was transferred from the general unit with single cells to a general cell block with triple cells," Alla Bout told Sputnik, clarifying that this was also part of the punishment for his RT interview. In August, Bout was prohibited from making calls for two months because during his phone interview with the broadcaster, an RT producer, whose name was on the list of Bout’s approved contacts, handed the receiver to a host who was not registered as an authorized contact. Bout was also banned from purchasing items in the prison shop and had his 25-year sentence prolonged by 15 days. Bout was arrested in Bangkok in 2008 in a joint operation between Thai and US authorities on charges of allegedly agreeing to supply Colombian rebels with weapons and therefore conspiring to kill US nationals. He was extradited to the United States in 2010 and sentenced to 25 years in prison. In May 2016, US judge Shira Scheindlin, who sentenced Bout, said in an interview with The New York Times newspaper that she gave the shortest sentence she could in such circumstances, but added that the punishment was excessive and inappropriate and that the arrest took place after a false-flag intelligence operation against Bout.